THE search for extraterrestrial intelligence (SETI) could be taking the wrong approach. Instead of listening for alien radio broadcasts, a better strategy may be to look for giant structures placed in orbit around nearby stars by alien civilisations. "Artificial structures may be the best way for an advanced extraterrestrial civilisation to signal its presence to an emerging technology like ours," says Luc Arnold of the Observatory of Haute-Provence in France. And he believes that the generation of space-based telescopes now being designed will be able to spot them. Arnold has studied the capabilities of space-based telescopes such as the European Space Agency's forthcoming Corot telescope and NASA's Kepler. These instruments will look for the telltale dimming of a star's light when a planet passes in front of it. They could also identify an artificial object the size of a planet, such as a lightweight solar sail, says Arnold. His work will be published in The Astrophysical Journal (www.arxiv.org/astro-ph/0503580). Arnold has determined the characteristic transit signal that differently shaped objects would produce, including a Jupiter-sized equilateral triangle and a louvre - parallel slats with gaps between them. Corot and Kepler will be capable of distinguishing these objects from most planets, though they could still be confused with a ringed planet like Saturn, he says. 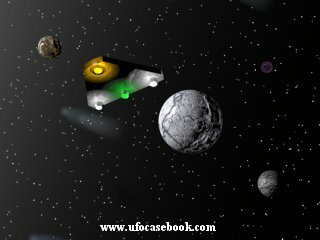 To ensure the signal is unambiguous, an alien civilisation would have to launch a number of objects into orbit around a star. As an example, Arnold imagines 11 objects orbiting a star in groups of one, two, three and five - the first prime numbers. The time interval between each group could also encode prime numbers if the objects were powered rather than orbiting freely. He thinks any civilisation that can engineer giant structures in space would probably not find this a problem. Arnold believes that this type of signalling is at least as effective as broadcasting a message using a high-powered laser pulse or a radio signal, which SETI is searching for. The best place to begin looking for artificial structures could be around dwarf stars. Their small size means they can be dimmed by the transit of a relatively small object, making them the best bet for an advanced civilisation wishing to announce itself. But SETI researchers aren't changing tack just yet. "Arnold's proposal falls within the category of SETT - the search for extraterrestrial technology," says Paul Schuch, executive director of The SETI League in New Jersey. "SETT is entirely complementary to SETI, which is narrowly defined as the search for electromagnetic emissions from other technological societies. The SETI League actively encourages and enthusiastically endorses such research," he adds.